Did it zoom by for you too? Have you bought your Valentine's card for those you love? You mean January has gone? Oh gosh, so it has!!! This year seems to be rushing by faster than the last at at my age I need time to slow down or even stop occasionally. Love those red birds but have no idea what they are. They are very beautiful. I have of birds called 'cardinals' and was wondering if that is what they are. I REALLY need to get out and buy a Valentine Card for hubby considering that we have what is supposed to be a VERY big snowstorm to arrive on the 12th. argh..why does time go by so fast? i wonder..
love those bits of red. 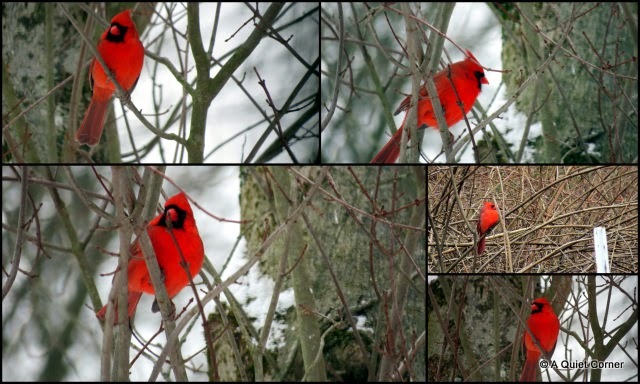 I love these shots of the vivid red male cardinals. Gorgeous red bird - brightens up your snowy days I'm sure. Haven't made one card yet but when I get home from work tomorrow night I'll make a start. January gone and almost halfway through Feb already... scarey. These birds really add such a much needed bit of colour in the winter! I almost missed this pretty Cardinal post. They are beautiful. Lovely mosaic!